This year the descendants of Dolph Barker and Lois Link are celebrating their lives and the love story that began 100 years ago in Holland, Georgia. In 1908 Lois Link left her home in Thomasville, Tennessee, to accept a teaching position at the Holland School in rural northwest Georgia. She only taught there one year, but Holland would become her home and the center of her family. One of the county's oldest schools was built in the Holland-Chattoogaville community just south of New Hope South Baptist Church in the early 1890s. The names of some of the teachers who worked in this first Holland school were: Miss Hugh Lee Knox, Miss Mary Hemphill, Miss Sarah Meroney, Miss Lula Worsham, Miss Daisy Davidson and Miss Maude Sewell. On August 10, 1896, Mr. John Pinkney (Pink) Holland, father of Mary, Bertha, Housch and Foster Holland, gave the land for the second Holland school. It was a one room school located southeast of the third and last school built in Holland. Mr. Pink Holland put an ad in a Methodist magazine for a teacher. Lois Link of Cheatham County, Tennessee, near Nashville answered his ad and was hired to teach in 1908. She was 21 years old. Mr. Pink Holland paid her salary for teaching that year. Miss Link later married Mr. A. M. Barker and taught in Holland following his death. 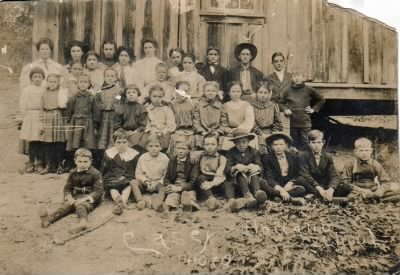 The attached photo shows the second Holland School during the 1908-09 session with Miss Link in the center of the back row of students.